Enjoy a great combo tour with this tour that includes a helicopter flight to the Grand Canyon followed by rafting through the magnificent Black Canyon. A truly wonderful experience, The Grand Celebration with Black Canyon Rafting allows you to view multiple levels of the Grand Canyon, the Colorado River and the amazing Black Canyon. Embark on an unforgettable narrated helicopter tour, and see historic landmarks and scenic desert beauty. See sights such as Hoover Dam, Lake Mead, and the mighty Colorado River from the skies above. Upon entering the West Rim of the Grand Canyon, soar over Hualapai Land, and pass by the Skywalk Glass Bridge, one of the highest man-made structures in the world. As your helicopter descends 4,000 feet (1,219 meters) to the canyon floor, take in the magnificent beauty of the canyon walls surrounding you. On the bank beside the Colorado River, you can witness first hand the geological history of the rock formations within the West Rim's canyon walls. 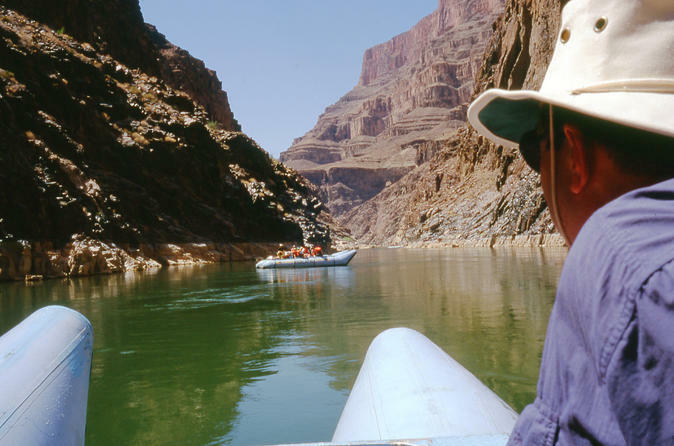 Experience beautiful views of the amazing Colorado River as it flows along the Grand Canyon floor.